Trove is the latest addition to Trion’s growing list of available titles. The game is voxel-based, fully destructible, and has a similar, but brighter and more fluid, graphic style to Minecraft. It features elements from both sandbox and hack’n slash RPGs. You’re able to build to your hearts content in your own personal space which can be displayed in the open game world, while adventuring in beautiful and interesting worlds with friends. The game also features group worlds that players can create and design from the ground up. 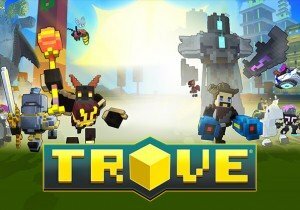 It seems as though Trove has all its needs to be one of the best casual gameplay experiences out there. As you might expect, the character creation in Trove is not very in-depth. However, that is more than made up for by the plethora of unique weapons, masks, hats, and more. The fact that you can turn all your old gear into skins provides a whole other layer of customization, too. Because of that, I’ve found Trove to be one of the better games I’ve come across when it comes to unique-looking characters. It’s difficult to find someone who even looks remotely similar to you. You’re going to come across a lot of weird hats and masks. Early on, I fell in love with collecting as many mask skins as I could. I liked the hats, too, but it was mostly the masks I found enjoyable. While doing dungeons, you’ll come across a lot of different types. The neat thing is, it appears as though a large majority of hats, masks, and weapons are designed by players. You can head over to the Trove Creations sub-reddit to check it out. Bright and happy is the best way to describe the art style in Trove. Everything has a cartoonish twinge to it, from the textures to the designing of the models themselves. Even in the areas with “darker” themes, the graphics are more fun than anything else. The enemy design makes the game feel even more cartoony, with boss mobs that look like metal cages with boxing gloves inside that shoot out and knock you across the room. If you’ve watched American cartoons, you’ll be familiar with the concept. The controls in Trove are superb. I never ran into an issue with them in all the hours I’ve put into the game so far. Usually I can find something to gripe about, but I’m struggling here. I suppose I could complain that they use B as the default keybinding instead of the usual I for inventory, but even that isn’t an issue. Trove will be getting a 5/5 for me when it comes to controls. The game is perfect for playing with people you already know – the download is small, there are plenty of features to make you and your friends have fun together, and it’s something you can pick up and get into quickly. On the other side of the spectrum, I found myself not playing the game at all unless my friends were up for a session. It’s not that I couldn’t get in and play with random people – the game basically promotes this by rewarding anyone who participates (or is even nearby) combat. However, the fun factor drops noticeably when not in your core guild group. Perhaps that’s just me though, but I feel like Trove is the type of game you’ll want to play with people in Skype or Team Speak over anything else. That’s not to say it’s impossible to play with others. Heck, Trion does an extremely good job at making it easy for you to friend with people and join in their fun. There’s also various chat channels and, believe it or not, there’s a decent economy in the game. And it’s just a couple of clicks to get someone into your Club. And you really do want to join up with a good Club with a well-developed club world as it’ll give you access to all the high-end crafting stations and tools right off the bat, instead of requiring that you spend a lot of time farming items to build everything. Gameplay in Trove is both casual and in-depth. You can hop in and play for ten minutes at a time and feel like you’ve accomplished a lot. And there always seems to be something new to discover – be it some rare item with an awesome skin, or a dungeon you’ve never seen before. Heck, my favorite part of the game is simply exploring around and looking at the various dungeons in the game. I’ll never forget the first time I came across a giant cactus wearing a cowboy hat or the Mario 64-esque flower sky castle. There are currently five classes in the game for you to play, level-up and equip. These are the knight (tanky melee), Gunslinger (ranged DPS), Fae Trickster (support-like caster), Dracolyte (Mage that can transform into a dragon), and Neon Ninja (DPS melee). There’s also a sixth class that has been announced, the Candy Barbarian. Each of these classes is leveled individually, but you’re able to switch between them easily. You’re only given access to the Knight and Gunslinger by default, but due to daily bonuses and other activities, you can gain a special currency that will allow you to purchase a new class every few days. Or you could just spring for it and buy them with real money. Combat in Trove is a blast. It’s a true-to-its-word Hack’n Slash, with constant action and a lot of movement. You’re only given four moves to work with, so it’s easy to learn your class. If you enjoy cutting through large and numerous enemies, this will be the game for you. There are dungeons full of diverse enemies all over the place and even roaming mobs to take on. Each and every corner seems to hide an interesting encounter in Trove. Biomes are themed land areas within the various “worlds” in Trove. They can be a spooky haunted land, a beautiful fairy kingdom, or a parched desert. My personal favorite is the techno-themed Data biome. Depending on the biome you’re in, you’ll run into certain types of enemies and dungeons. Each has its own unique look and feel, so there’s a definite difference between them all. What’s cool is you can “import” some of the biomes into your Club World (which I’ll get into later). Dungeons get a bit insane at times. Dungeons are simply ridiculous in Trove. And I mean that in a good way. Take any happy or fantastical dream you’ve ever had and you’ll probably find it (or something resembling it) within Trove. I’ve seen dungeons that look like giant train stations, cactus with cowboy hats, floating castles, dragons perched on lava-spewing hills, theaters… There’s so many and I’m fairly certain I’ve only seen a fraction of what’s available after hours and hours of play. Besides the look of a dungeon, the gameplay offered of the dungeons typically falls into a predictable formula. Depending on the star-rating of a dungeon, there will be one or more bosses. A majority of dungeons have a single boss. You go in, fight your way to the boss, loot the chest he drops, and then use the portal that spawns to teleport back out. The higher starred dungeons will have multiple bosses, or rooms with special totems that spawn wave after wave of enemies that must be killed. Generally, the harder the fight, the better the reward. Which brings me to the loot. It seems like the loot in Trove has randomly generated stats, for the most part. And due to the large (and ever increasing) selection of models available for the various items, it will be a while before you begin to get duplicates (in terms of looks) of items you’ve gotten in the past. Because of the way loot works, it encourages you to go out and clear dungeons over and over, looking for the rarest and best of gear. Or you might just be trying to fill out your styles page. Cornerstones are something unique to Trove. I’ve never seen it done like this in any other game. Spread throughout the various worlds, including the hub world, are these platforms. You can temporarily claim these and use them to spawn your personal cornerstone. That means while you’re in the hub world you can bring out your completely customized home to prepare for adventures, and then when you’re out and about and realize you need to refill your flask or recycle your loot, you can just find the nearest vacant cornerstone to summon your own personal domain for yourself, your group, or anyone passing by to use. Which brings me back to Club Worlds. When you create (or join) a club, it grants you access to a Club World. This is a large space, much larger than the Cornerstones, where members of a club can hang out, chat, build, or make use of communal crafting stations. This can encourage you to join an established club in order to gain access to their well-stocked Club World. Other games give this type of communal land for guilds, but none do it quite like Trove has managed to do. What’s really amazing is the amount of customization that goes into play with these Club Worlds. You already have Trove’s robust building system, but in Club Worlds you actually build the world one piece at a time. You start out with a single, small, piece of land and from there you and your club mates can farm resources to build further chunks of lands with various themes that often mirror the biomes you can find while adventuring. Right now the selection is fairly slim, but I imagine as Trove continues to evolve more and better options will become available. Crafting in Trove is a lot more in-depth than I initially thought it would be. There’s a plethora of stuff to craft – heck there’s even a special dungeon type that specializes in dropping crafting recipes – and you’ll seemingly always have something to strive for. Even my friend who has invested more time in the game than anyone I’ve met still seems to have one project or another he’s working towards. Plus Trion has already proven with their Trove Halloween event that they plan to introduce temporary holiday-specific craftables. This is one of the few games where I felt like I could always have a project to work on and not have that project feel like a chore. I’m going to close-up by mentioning the mounts and mag-riders. Mounts are fairly self-explanatory – they’re things you ride to get around faster. Right now there’s only a limited selection, but these range between horses, alligators, and bouncy-balls. You can get them either through crafting, buying with a currency that is gained in-game, or purchase them using cash. There was a special pumpkin bouncy-ball mount that was available during the Halloween event, which gives me hope for there being a lot of absurd and interesting mounts being added in the future. I'm not going to make it! Mag-riders are similar to mounts in that they’re something you ride. For the most part, they don’t have much use in adventuring. I’ve only run into mag-rails in the open world on rare occasions. Usually you will come across them in a player’s Cornerstone or a Club World, and they can be a blast to ride. But because they’re not very practical, they’re seen more as a luxury rather than a necessity, unlike the regular mounts. I am almost 100% sure Trove will be a hit. It’s already got a large and healthy player-base. My only worry is that players will get bored of the game after they’ve played for a few weeks or months. While there’s certainly a lot of alluring and engaging content, I’m not sure there’s enough there to keep people playing for the long-term. But, despite that fear, I plan to continue to play Trove with my friends as it’s one of the more delightful games I’ve played in recent years. Features: 4/5 – A lot of good stuff. Customization: 4/5 – Would be nice to have some more options for customizing your torso. Graphics: 5/5 – I love the style of the graphics. Controls: 5/5 – They worked perfectly. Community: 3/5 – It’s alright but you’re best bringing your own friends. Overall: 4/5 – Certainly not the perfect game, but the potential is definitely there. Webzen has released a new trailer for the upcoming Gunslinger class in Continent of the Ninth Seal today. Has this happened to you in BDO? You murder a bunch of players, and suddenly you can't go into towns because of Karma Penalties?